Hot on the heels of this years DENFAIR, we are excited to bring you a sneak peek of our latest designs. This year we launched three new lighting collections – Edo, Snag and Snitch – all of which are imbued with personality and character. Edo is our first outdoor light and takes its name from the Edo period in Japanese history when art and culture thrived and maneki-neko (beckoning cat) emerged as a lucky symbol. The spun aluminium disc projects from the wall and is available in a choice of metallic anodised colours and painted monochrome finishes. The dedicated LED light source is fully dimmable and cleverly reflected from inside the fitting. This provides practical lighting suitable for outdoor and indoor settings, including bathrooms. Snag is a linear pendant and wall light infused with a retro 1980s aesthetic. 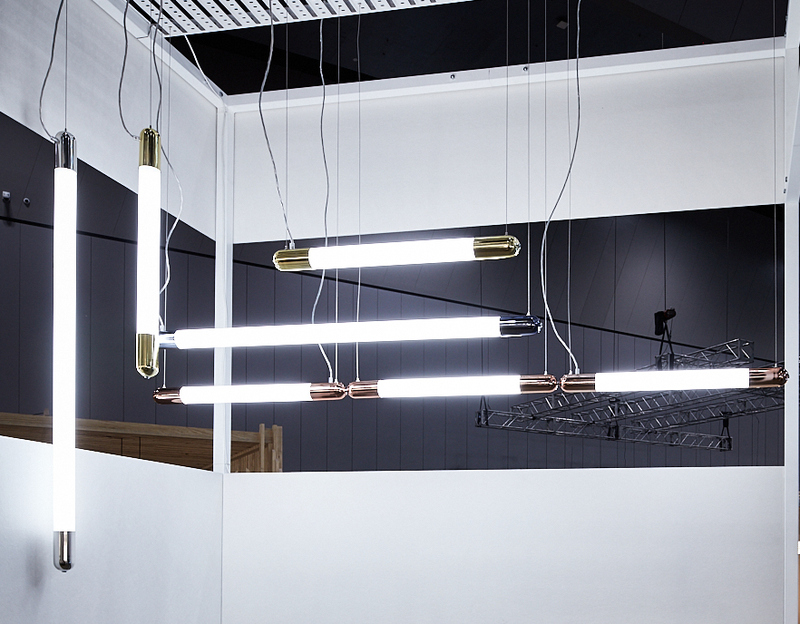 With a long cylindrical form and rounded ends the light takes its inspiration and name from the snag – classic Australian slang for sausage, and the relaxed lifestyle that is associated with their consumption. The metallic ends of Snag are spun in aluminium and available in a choice of bright copper, bright brass, bright stainless steel and bright black chrome. Snag can be wall or ceiling mounted. As a pendant it can be suspended horizontally or vertically, or joined to make a string of Snags. We unveiled a prototype of Snitch at DENFAIR 2017, and this year the production form is released. Snitch is a pendant light inspired by the swinging spheres of Newton’s Cradle. It comprises individual glowing orbs (in arrays from 4 to 400) that are arranged in a grid format. Each orb is machined from solid brass and finished in either black, gold or a custom finish. A matt hemisphere diffuses each dedicated LED lamp source with dimming by a choice of control protocols. Three existing products were also on display at DENFAIR 2018: Grapho Bubble, Teamwork and the award-winning Fab 25. Recognised for its outstanding design and innovation, Fab 25 Table Lamp received a prestigious 2018 Good Design Award for Product Design. The lamp is the evolution of our original Fab Lamp and it continues to embody many of the concepts that our founders Simon Christopher and Celina Clarke originally set out to explore: local batch production, flat-pack assembly and end-of-lifecycle recycling. Fab 25 is a portable, modern and appealing table lamp with an elegant shape machined from aluminium and brass. It also incorporates the latest technology including LED lamp, cordless battery power and USB re-charging. Grapho Bubble Pendant is handcrafted in Melbourne from Japanese rice paper and it mysteriously inflates and deflates when turned on or off. First launched at DENFAIR 2017, Grapho takes its name from the word meaning ‘to write’ or ‘to sketch’ as custom graphic designs can be added to the pendants during production. A small fan inside the Grapho Bubble Pendant is connected to the sustainable LED light source and inflates the rice paper when switched on, and gently deflates when switched off. The Teamwork pendant demonstrates a mastery of both light and sound with special acoustic qualities that making it perfect for workplaces. The spun aluminium shell has a decorative fabric panel that discretely conceals sound absorbing material. In doing so, the pendant helps to enhance concentration and collaboration in the workplace by reducing ambient noise through its clever acoustic qualities and outstanding light output. Stay tuned to ISM Objects Blog over the coming weeks as we bring you more on our latest products.